﻿ What Was the Holocaust? Do States and citizens have responsibilities? Does silence contribute to oppression? What are the roots of prejudice and oppression? Can modern technology be abused? A poignant introduction by the author (official biographer of Winston Churchill) is followed by his instructive analysis of anti-Semitism in Europe, from Martin Luther's venomous fulminations against Jews to the motivating power of anti-Semitism in the National Socialist movement. Hitler's "final solution" began formally within hours of the German invasion of Russia, a campaign that, as Gilbert shows, provided an opportunity for genocide hitherto lacking. With a relentless accumulation of detail and eyewitness accounts, he writes of the systematic efficiency of the Nazi attempt to destroy European Jewry and the widespread disbelief that such could be happening. Though the figure of Adolf Hitler remains in the background, such executives as Himmler, Eichmann and Mengele are very much in evidence throughout the gripping narrative (there is new material on the latter's labors at Auschwitz). An element in the historical tragedy that Gilbert stresses is the deliberate destruction of children one of Mengele's principal interests which the author calls "the new barbarism." The narrative reaches its dreadful climax with the convergence on the death camps of the Allied and Soviet armies, a time when "rescue and slaughter marched hand in hand." A particularly disturbing section deals with outbreaks of anti-Semitism after the German surrender. On July 4, 1946, for instance more than a year after V-E Day 42 Jews were massacred by Poles in the town of Kielce. Gilbert brings within the pages of this volume all the major substantiated evidence of Jewish resistance throughout the war, plus many examples of Gentiles risking their lives to protect Hitler's prey. I saw my first horror camp [on 12 April 1945]. It was near the town of Gotha. I have never been able to describe my emotional reactions when I first came face to face with indisputable evidence of Nazi brutality and ruthless disregard of every shred of decency. Up to that time I had known about it only generally or through secondary sources. I am certain however, that I have never at any time experienced an equal sense of shock. Not long ago, and not far from where we live, ordinary people across Europe became complicit in the murder of their neighbours. What will young people’s education amount to if they do not confront this appalling truth ? From 1941 to 1945, Jews were targeted and methodically murdered in a genocide, one of the largest in history, and part of a broader aggregate of acts of oppression and killings of various ethnic and political groups in Europe by the Nazis. Every arm of Germany's bureaucracy was involved in the logistics and the carrying out of the genocide, turning the Third Reich into "a genocidal state". Non-Jewish victims of broader Nazi crimes include Romanis, Christian Poles, communists, homosexuals, Soviet POWs, and the mentally and physically disabled. In total, approximately 11 million people were killed, including approximately one million Jewish children. Of the nine million Jews who had resided in Europe before the Holocaust, approximately two-thirds were killed. A network of about 42,500 facilities in Germany and German-occupied territories were used to concentrate, confine, and kill Jews and other victims. Between 100,000 and 500,000 people were direct participants in the planning and execution of the Holocaust. The persecution and genocide were carried out in stages. Initially the German government passed laws to exclude Jews from civil society, most prominently the Nuremberg Laws of 1935. A network of concentration camps was established starting in 1933 and ghettos were established following the outbreak of World War II in 1939. In 1941, as Germany conquered new territory in eastern Europe, specialized paramilitary units called Einsatzgruppen were used to murder around two million Jews and "partisans", often in mass shootings. By the end of 1942, victims were being regularly transported by freight train to specially built extermination camps where, if they survived the journey (see Transport), most were systematically killed in gas chambers. The campaign of murder continued until the end of World War II in Europe in April–May 1945. Jewish armed resistance to the Nazis occurred throughout the Holocaust (see Resistance). One notable example was the Warsaw Ghetto Uprising of 1943, when thousands of poorly armed Jewish fighters held the Waffen-SS at bay for four weeks. An estimated 20,000 to 30,000 Jewish partisans actively fought the Nazis and their collaborators in Eastern Europe. French Jews were also highly active in the French Resistance, which conducted a guerilla campaign against the Nazis and Vichy French authorities. In total, there were over a hundred armed Jewish uprisings. "Thus for the time being I have sent to the East only my 'Death's Head Units' with the orders to kill without pity or mercy all men, women and children of Polish race or language. Only in such a way will we win the vital space that we need. Who still talks nowadays about the Armenians?" The term ‘Genocide’ was coined by Polish writer and attorney, Raphael Lemkin, in 1941 by combining the Greek word 'genos' (race) with the Latin word 'cide' (killing). For the Nazis it began with a simple boycott of Jewish shops and ended in the gas chambers at Auschwitz as Adolf Hitler and his Nazi followers attempted to exterminate the entire Jewish population of Europe. On April 30, 1945, surrounded by the Soviet Army in Berlin, Adolf Hitler committed suicide and his Reich soon collapsed. By now, most of Europe's Jews had been killed. Four million had been gassed in the death camps while another two million had been shot dead or died in the ghettos. The victorious Allies; Britain, the United States, and the Soviet Union, then began the daunting task of sorting through the carnage to determine exactly who was responsible. with 22 surviving top Nazis charged with crimes against humanity. From The Nazi rise to power was perceived by the world, especially the West, with concern. However, gradually the new regime attained a certain degree of legitimacy. This legitimacy was strengthened by a world-wide participation in the 1936 Summer Olympics in Berlin, despite attempts to have them cancelled. Numerous reports on violations of the rights of German Jewry and then of Austrian Jewry, had reached the Free World throughout the 1930’s. For example: segregation of the Jews and dispossession of their property. This, however, elicited only weak protests. Most countries even closed their doors to Jews who sought to leave Germany. Throughout the war, military matters were the top priority for countries at war with the Nazis. As a result, information concerning the persecution and murder of the Jews was pushed aside. Reports on what was happening in the ghettos and death camps, sometimes endangering the life of the person conveying the information, was at times regarded with disbelief. The Holocaust never became a first priority on any agenda. It was generally believed that the best way of stopping the atrocities of the Nazi regime was to win the war. Furthermore, influential international figures and bodies, such as the Catholic Church, generally refrained from engaging in any unequivocal protest measures against Nazi Germany. Even when the magnitude of the atrocities at Auschwitz became clear, the Allies did not bomb the camp. There were, nevertheless, cases in which diplomatic intervention by other countries - especially the United States - prevented the murder of many Jews. This occurred, for example, in Romania and Hungary. Perhaps the Holocaust’s main theological effect is the radically changed position by the Roman Catholic Church toward Jews. Important Holocaust facts to help us remember. "To forget a holocaust is to kill twice." 1. Between 1933 and 1945, more than 11 million men, women, and children were murdered in the Holocaust. Approximately 6 million of these were Jews. Jehovah’s Witnesses, Roma Gypsies, homosexuals, and the disabled. 2. Prisoners, mainly Jews, called Sonderkommando were forced to bury corpses or burn them in ovens. Most Sonderkommandos were regularly gassed, and fewer than 20 of the several thousand survived. Some Sonderkommandos buried their testimony in jars before their deaths. 3. Most people who were deported to concentration camps during the Holocaust were transported in cattle wagons. These wagons did not have water, food, a toilet, or ventilation. The longest transport of the war took 18 days. When the transport doors were open, everyone was already dead. entered the lower layers of air first and then rose slowly toward the ceiling, which forced victims to trample one another in an attempt to breathe. Stronger victims were often found on top of the pile of bodies. It took 20 minutes to kill everyone in the chamber. and 100,000 worked as slave laborers. to make the selection of Holocaust victims more efficient. physically handicapped were surgically sterilized, often brutally. where they were forced to wear pink triangles. An estimated 6,000-9,000 homosexual inmates died in the camps. 9. After being liberated, thousands of concentration camp prisoners died within their first week of freedom from malnutrition and disease. 10. General Eisenhower ordered every citizen of the German town of Gotha to tour the concentration camp Ohrdruf (a subcamp of Buchenwald). they went home and hanged themselves. The Nazi regime attempted to establish a system of rule based upon race. The National Socialists (Nazis) saw themselves as a revolutionary movement and their goal as a radical reshaping of existing society The Jews were the chief enemy to be eliminated. THE HOLOCAUST was the outcome through the systematic murder of six million Jews. This was expanded at the Wannsee Conferences and meetings on the "Final Solution". The Nazis had no plan to gas Jews and others in concentration camps. This evolved over time, beginning with systematic persecution aimed in part at encouraging Jewish emigration from Germany to other countries. It grew from spontaneous murders to planned massacres of Jewish communities, to the establishment of an industrial apparatus for the efficient, wholesale slaughter of a people. In recognition of the evolving nature of the genocide, the date most frequently associated with it is January 30, 1933 when Adolf Hitler was appointed German chancellor. When does Persecution Become Genocide? 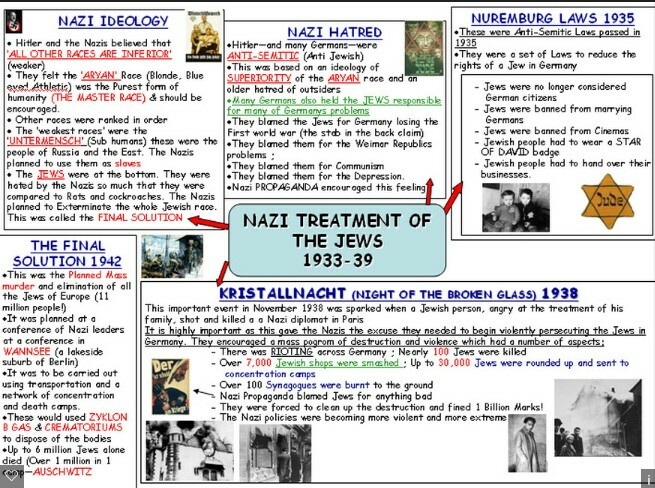 A major turning point in Nazi policy toward Jews was the coordinated attacks by the Sturmabteilung (or SA, the original paramilitary wing of the Nazi Party) against Jews and Jewish institutions and businesses throughout Germany and Austria on November 9-10, 1938 – an event known as Kristallnacht or the Night of the Broken Glass, due to the high number of shattered windows at Jewish properties in its aftermath. At least 91 Jews were killed, and 30,000 arrested and interned in concentration camps (but not extermination camps). Over 900 synagogues and 7,000 Jewish businesses were severely damaged or destroyed. Or at the Wansee Conference of January 20, 1942 when fifteen high-ranking Nazi party and German government leaders agreed the "Final Solution of the Jewish Question" and the part all offices and administrative departments were to play. The end of the Holocaust is usually thought to be May 8, 1945, or VE (Victory in Europe) Day, when the Allies formally accepted Germany’s unconditional surrender, ending World War II on the Continent, although fighting continued in the Far East. Europe's Jewish population in the 1930's numbered nine million. Six million had been murdered by the end of World War II in 1945, many of whom had been reduced to ashes in facilities built by Hitler's regime as part of the The Nazi ‘Final Solution to the Jewish Question’. Every arm of Germany's bureaucracy was involved in the logistics in carrying out of the genocide, so turning the Third Reich into "a genocidal state". Between 100,000 and 500,000 people were direct participants in its planning and execution. Of the nine million Jews in Europe before the Holocaust, approximately two-thirds were killed. A network of about 42,500 facilities in Germany and German-occupied territories were used to concentrate, confine, and kill Jews and other victims. How could a "Christian" society, including doctors, as highly educated and cultured as that of 1930's Germany spawn such evil? From this we can also learn why over another 55 million civilians have been been murdered and why their death have become further examples of Genocide. Understanding the Holocaust explains Why We Need to Teach and Learn About the Holocaust which Happened 80 Years Ago. Throughout the Arab world, during the late 1940s and 1950s, the historic Sephardi communities were reduced to a fraction of their prewar size or eliminated. most of the Jews killed in the Holocaust were not German. Only those who went through it, and felt it, truly knows what it means.